Официальный сайт - Михаила Чекалина - Mikhail Chekalin - 13. 2001 - "Вероятностная симфония в стиле джаз в 5 частях для 4 исполнителей"
13. 2001 - "Вероятностная симфония в стиле джаз в 5 частях для 4 исполнителей"
IN FIVE PARTS FOR FOUR PLAYERS"
В ПЯТИ ЧАСТЯХ ДЛЯ ЧЕТЫРЕХ ИСПОЛНИТЕЛЕЙ"
© + (Р) 2001 Leo Reords, Golden Years of New Jazz, GY 407. All music published by Alissa Publishing / PRS. Analogue recording transferred to digital by Simon Brewer. Design by Lora Denis. Produced by Leo Feigin. Mikhail Chekalin - synth., voice, piano. Sergey Trofimov - el. guitar. Valery Zhilin - drums. Yuri Belenko - saxophones. Music by Mikhail Chekalin and Sergey Trofimov. 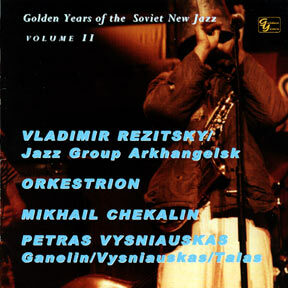 Recorded May 21, 1994, live at the theatre "Sovremennik", Moscow. Sound engineers: Alexander Aizenshtadt, Sergey Platonov. Mixed by Mikhail Chekalin. Special thanks to Natalya Vlasova and Alexander Aizenshtadt. Previously unreleased recording. 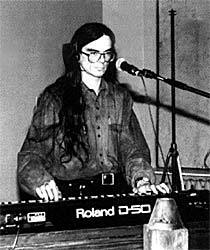 Mikhail Chekalin is perhaps the leading artist from Russia in terms of cosmic synthesizer sound. His discography is huge, may be over 30 or 40 LPs and CDs both in Russia and in Germany, yet his name will be new to many new music fans. Through the 1980s and half of the 1990s Chekalin was just about the only genuine underground musician in the former Soviet Union. He made it his aesthetic, social and political concept "not to conform, mix or collaborate with anybody else, be it official Soviet culture or the musicians representing so-called "second culture". All these years he's been a "lonely wolf" working completely alone in a studio. The only exception of those years is his "Probability Symphony in the Style of Jazz" which is presented on this CD. In his own words, he'd been flattered that a young guitarist from Dnepropetrovsk (Ukraine), Sergey Trofimov, knew about him and his work, and wanted to record with him. On Chekalin's advice, for his following visit to Moscow Sergey Trofimov brought with him a saxophonist and a drummer and off they went to the theatre to record live without any rehearsals, discussions or intervals - just one take with tiny breaks between the parts. "Mikhail Chekalin is certainly one of the most radical and innovative synth players around. He's taken the art of synth music way beyond its generic form and startled many with his bizarre sonic creations. His music covers a multitude of styles, from spacious synth music through to carefully conceived constructions built out of sampled sounds" (Alan Freeman). Chekalin's music is impossible to pigeon-hole. He mixes pure space music with rhythmic soundscapes, but his space music is steeped in orchestral grandeur, electronic eclecticism and vocal sensuality. He's been compared with a sonic sorcerer who summons forth the spirits of his Russian heritage and impregnates them with cosmic emotions. Beauty, mystery, yearning and majesty converge to form a dreaming pool of apprehension and enchantment. Mikhail Chekalin was born in 1959. He was sent to a music school, then to music college, and after that to the Institute named after Gnesins. During all these years he had to study piano playing, singing, and conducting. By the end of the 1970s he was making a living by performing entirely different kinds of music on the piano, singing in all sorts of choirs, and even playing in restaurants. 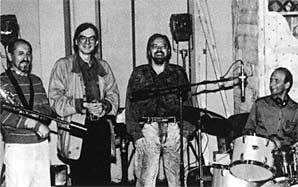 In 1982, however, he abruptly stopped performing in public and made a decision to work in a studio which he built with his architect brother in a basement of one of the houses in Moskvina street in Moscow. The studio became a meeting place for creative artists. It was frequented by students, film and theatre directors, painters and even psycotherapists. During this period Chekalin used to arrange his own performances which were not sanctioned by the authorities. Some of these concerts finished in detentions by the KGB. The next stage in Chekalin's artistic development was his audio-visual performances with the use of light dynamics and laser effects. From the mid-80s Chekalin wrote a lot of music for theatre, films, ballets, etc., but his main concern remained his spontaneously composed works recorded in his studio.